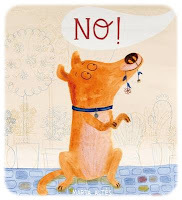 PICTURE BOOK CAROUSEL: Naugthy doggies! Two picture books, one of them released very recently, the other one last July, really struck in the Library Mice household. Since the arrival of Bear the chocolate labrador, things have been quite lively. Even the titles of the books say a lot about what it is like to be a dog owner! There once was a well-meaning dog called No who was desperate to please his owners: he helped them to get to places faster, he warmed their beds before they went to sleep and even help them with the laundry. He loved his owners very much and they loved him a lot in return … or did they? Young readers will love this deluded pup; Altés’ style is both gentle and a little rough, conveying both the kind nature of the dog and his obvious love for all things mucky. No! is a great read-aloud which will appeal to children young and old, and will definitely result dog-owners in reminiscing over a few familiar situations. When his owner Harris has to pop out, George the dog promises he will be good. And he does try, very hard. But the temptation of a cake in the kitchen, the appearance of the cat, the fresh soil in the plant pot, all are too much to bear for poor George who find himself creating chaos despite his best intentions. When Harris returns and discovers the mess, George feels very guilty, so when Harris takes him for a walk, he is desperate to redeem himself. But will his resolve last in the face of the ultimate temptation? 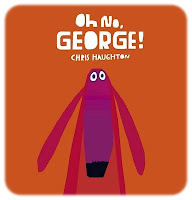 George and his struggles with his conscious take centre stage in the second picture book from award-winning Chris Haughton (see my review of A Bit Lost here) and it is hilarious. There is a element of pantomime in this story, with the text inciting audience participation and this works extremely well. Little readers get to anticipate what George will do next, until the very last page … where they are left to decide George’s fate: will he or won’t he? Lots of discussion will ensue as to what really happens at the end. In the Library Mice household, we decided that he probably did do it (because Bear would!). But you will have to read it yourselves to make up your own minds. What I love best about Haughton’s work is his use of colour: bold, bright, unexpected. For a recent interview on Playing by the Book, Zoe had asked on Twitter what question we would ask him and I mentioned his unusual use of colour (see the interview here). His reply was that he does not try to use the colours one would expect animals to look like but rather what has the best effect on the page. It works so well and it is the illustrations that first and foremost tell the story. George’s facial expressions are particularly hilarious, you can really sense his inner struggles. Oh No, George! is a joy to read aloud, and again one which will delight dog owners. But I wonder how many little readers will relate to his desperate attempts at being good, without quite ever achieving it? No! and Oh No, George! could not be more different in style, but both tell a compassionate yet mirthful tale of dog behaviour. Beware of little people asking to get a dog after reading them! 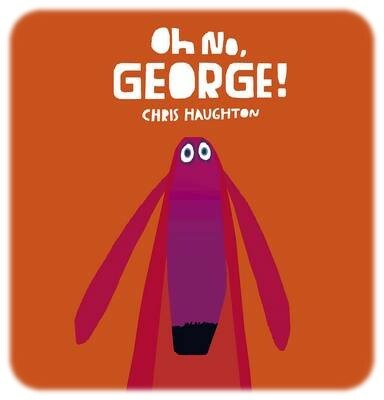 Thank you to Walkers books for providing a review copy of “Oh No, George!”. The copy of “No!” came from my wonderful local library service. PICTURE BOOK CAROUSEL: Dogs, dogs, dogs! 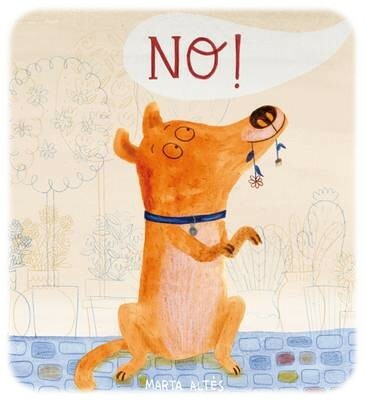 What delightful books – I shall be looking out for ‘No!’ especially, because I haven’t come across it before. I too love a picture book with text and illustrations telling two different stories. It allows the young reader to feel cleverer that both author and illustrator – which anyway they very often are!